The Great Flood of 1862 was the largest flood in the recorded history of Oregon, Nevada, and California, occurring from December 1861 to January 1862, caused by an ARkStorm. It was preceded by weeks of continuous rains and snows in the very high elevations that began in Oregon in November 1861 and continued into January 1862. This was followed by a record amount of rain from January 9–12, and contributed to a flood that extended from the Columbia River southward in western Oregon, and through California to San Diego, and extended as far inland as Idaho in the Washington Territory, Nevada and Utah in the Utah Territory, and Arizona in the western New Mexico Territory. The ARkStorm dumped an equivalent of 10 feet of rainfall in California, in the form of rain and snow, over a period of 43 days. Immense snowfalls in the mountains of the far western United States caused more flooding in Idaho, Arizona, New Mexico, and Sonora, Mexico the following spring and summer as the snow melted. The weather pattern that caused this flood was not from an El Niño type event, and from the existing Army and private weather records, it has been determined that the polar jet stream was to the north as the Pacific Northwest experienced a mild rainy pattern for the first half of December 1861. In 2012, hydrologists and meteorologists concluded that the precipitation was likely caused by a series of atmospheric rivers that hit the Western United States along the entire West Coast, from Oregon to Southern California. An atmospheric river is a wind-borne, deep layer of water vapor with origins in the tropics, extending from the surface to high altitudes, often above 10,000 feet, and concentrated into a relatively narrow band, typically about 400 to 600 kilometres (250 to 370 mi) wide, usually running ahead of a frontal boundary, or merging into it. With the right dynamics in place to provide lift, an atmospheric river can produce astonishing amounts of precipitation, especially if it stalls over the same area for any length of time. Prior to the flooding, Oregon had steady but heavier than normal rainfall during November and heavier snow in the mountains. :76–83 Researchers believe the jet stream slid south accompanied by freezing conditions reported at Oregon stations by December 25. Heavy rainfall began falling in California as the longwave trough moved down over the state, remaining there until the end of January 1862 and causing precipitation everywhere in the state for nearly 40 days. Eventually the trough moved even further south, causing snow to fall in the Central Valley and surrounding mountain ranges. There was an excessive amount of precipitation in November 1861 over most of Oregon, less so in the extreme northwest. It was cold enough at the higher elevations that much snow fell in the Cascade Range, which, when later melted by the warm rains produced a great quantity of water that flooded into the Willamette River and other streams in the Cascades. Tributaries of the Willamette rising in the Oregon Coast Range did not rise so high. Then the depression that came in at the beginning of December produced strong, warm southerly winds in Oregon, with extremely heavy rain. The crest of the flood was reached at Salem on December 3; at Oregon City on the 4th; at Milwaukie, between Oregon City and Portland, on the 5th; at Albany on December 8, a second rise at Albany greater than the first. The crest at Albany and Salem were the highest ever known at any time. In Oregon, the flood was one of the largest in the history of the Willamette Valley and the rest of Western Oregon. Flooding was heaviest on rivers with tributaries arising from the snow-covered Cascade Range. Tuesday evening a gloom settled on a scene such as probably never was witnessed in our Valley before. The ceaseless roar of the stream made a fearful elemental music widely different from the ordinary monotone of the Falls; while the darkness was only made more visible by the glare of torches and hurrying lights, which with the shouts of people from the windows of houses surrounded by the water, all conspired to render the hour one of intense and painful excitement. The flood has covered the highest mark of January '53, and is still rapidly rising. As late as anything could be seen the mills were still standing, but the insatiate monster is still creeping up inch by inch, winding its swelling folds round the pillars and foundations of all the houses in its way, crushing and grinding them in the maw of destruction, and sweeping the broken fragments into a common vortex of ruin. All night as on the night previous, people whose homes were being invaded hurried to places of security, glad to escape even with the sacrifice of all their goods. Flood damage was so great because the rivers in Oregon were the main routes of travel. The river front was the building site of mills, freight depots, and storehouses for grain and other foodstuffs. Business houses and many residences were near the landings. Farm buildings were mostly on sites convenient to the rivers, along with supplies of feed for livestock. Loss of so much wheat flour and demand from the new Idaho gold fields caused a spike in its price from $7 to $12 per barrel. In the interior of Washington Territory, in what is now Idaho, the storm creating the flood in Oregon dumped its precipitation as an unprecedented snowfall. Flooding on the Columbia River and the snow in the mountains closed off supplies to the new mining towns on the Salmon River, causing starvation among the miners of Florence, cut off from December until May 1862. In early July, as the heavy burden of snow in the mountains melted, the runoff caused great flooding. The Boise River flooded from extremely high runoff and is believed to have been four times larger than its largest recorded flood in 1943. Flood waters made the river expand to a couple of miles wide. It washed away or covered the original route of the Oregon Trail in the river valley. California was hit by a combination of incessant rain, snow, and then unseasonally high temperatures. In Northern California, it snowed heavily during the later part of November and the first few days of December, when the temperature rose unusually high, until it began to rain. There were four distinct rainy periods: The first occurred on December 9, 1861, the second on December 23–28, the third on January 9–12, and the fourth on January 15–17. Native Americans knew that the Sacramento Valley could become an inland sea when the rains came. Their storytellers described water filling the valley from the Coast Range to the Sierra. Fort Ter-Waw, located in Klamath Glen, California, was destroyed by the flood in December 1861 and abandoned on June 10, 1862. Bridges were washed away in Trinity and Shasta counties. At Red Dog in Nevada County, William Begole reported that from December 23 to January 22 it rained a total of 25.5 inches (65 cm), and on January 10 and 11 alone, it rained over 11 inches (28 cm). From November until the latter part of March there was a succession of storms and floods... The ground was covered with snow 1 foot (0.30 m) deep, and on the mountains much deeper... The water in the river ... seemed like some mighty uncontrollable monster of destruction broken away from its bonds, rushing uncontrollably on, and everywhere carrying ruin and destruction in its course. When rising, the river seemed highest in the middle... From the head settlement to the mouth of the Trinity River, for a distance of one hundred and fifty miles, everything was swept to destruction. Not a bridge was left, or a mining-wheel or a sluce-box. Parts of ranches and miners cabins met the same fate. The labor of hundreds of men, and their savings of years, invested in bridges, mines and ranches, were all swept away. In forty-eight hours the valley of the Trinity was left desolate. The county never recovered from that disastrous flood. Many of the mining-wheels and bridges were never rebuilt. The entire Sacramento and San Joaquin valleys were inundated. An area about 300 miles (480 km) long, averaging 20 miles (32 km) in width, and covering 5,000 to 6,000 square miles (13,000 to 16,000 km2) was under water. The water flooding the Central Valley reached depths up to 30 feet (9.1 m), completely submerging telegraph poles that had just been installed between San Francisco and New York. Transportation, mail, and communications across the state were disrupted for a month. Water covered portions of the valley from December 1861, through the spring, and into the summer of 1862. The rainy season commenced on the 8th of November, and for four weeks, with scarcely any intermission, the rain continued to fall very gently in San Francisco, but in heavy showers in the interior. According to the statement of a Grass Valley paper, nine inches of rain fell there in thirty-six hours on the 7th and 8th inst.... the next day the river-beds were full almost to the hilltops. The North Fork of the American River at Auburn rose thirty-five feet, and in many other mountain streams the rise was almost as great. On the 9th the flood reached the low land of the Sacramento Valley. In Knight's Ferry, in the foothills of the Sierra Nevada astride the Stanislaus River, about 40 miles (64 km) east of Modesto, the town's homes, its mill, and most of its businesses were ruined by the flood. The bridge spanning the river initially withstood the flood waters but was destroyed when the debris of the bridge at Two-Mile Bar, only a short distance up river, torn from its foundation, crashed into the Knights Ferry Bridge, crushing the truss supports and knocking it from its rock foundation. All Sacramento, excepting one street, part of Marysville, part of Santa Rosa, part of Auburn, part of Sonora, part of Nevada City, and part of Napa were under water. Some smaller towns like Empire City and Mokelumne City were entirely destroyed. Sacramento, sited at the junction of the Sacramento and American Rivers, was originally built at 16 feet (4.9 m) above low-water mark, and the river usually rose 17 to 18 feet (5.2 to 5.5 m) almost every year. The New York Times reported on January 21, 1862 that a trapper who had spent more than 20 years in California had frequently boated over the city's site, and in 1846, the water at the location was 7 feet (2.1 m) deep for sixty days. On 27 December 1861, the Sacramento River reached a flood level of 22 feet 7 inches (6.88 m) above the low water mark, after rising 10 feet (3.0 m) during the past 24 hours. 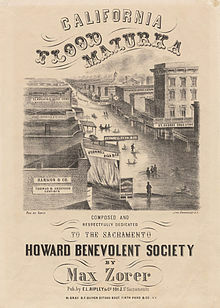 The Sacramento flood plain quickly became inhabited by a growing population during the Gold Rushserved as the central hub for commerce and trade and the home of political leadership, the California State Legislature. The landscape was recognized as a flood prone landscape located at the confluence of the American and Sacramento River. John Muir notes the extent of seasonal flooding in Sacramento, “…The greatest floods occur in winter, when one could suppose all the wild waters would be muffled and chained in frost and snow…rare intervals warm rains and warm winds invade the mountains and push back the snow line from 2000 to 8,000 feet, or even higher, and then come the big floods.”Political actions to address flood risk included an investment of more than $1.5 million on flood control and prevention through improved levee system around Sacramento and the great Sacramento area. However, the series of storms that led to the Great Flood of 1862averaged precipitation levels records show only occur once every 500 to 1,000 years . Geographical range of flooding in the state was noted by a traveling geologist from Yale University, William Brewer, who noted on January 19, 1862 “The great Central Valley of the state is under water—the Sacramento and San Joaquin valleys—a region 250 to 300 miles long and an average of at least 20 miles wide, a district of 5,000 or 6,000 square miles, or probably three to three and a half million acres! Although much of it is not cultivated, yet a part of it is the garden of the state. Thousands of farms are entirely under water—cattle starving and drowning.” From December to January of 1862 series of storms carrying high winds and heavy precipitation left city streets and sidewalks underwater. Photographs provided by the Center for Sacramento History shows water canals replacing city streets and boats docked to storefronts replaced by carriages. On Inauguration Day, January 10, 1862 the state’s eighth governor, Leland Stanford, traveled by rowboat to his inauguration building held at the State Legislature office. Much of Sacramento remained under water for 3 months after the storms passed. 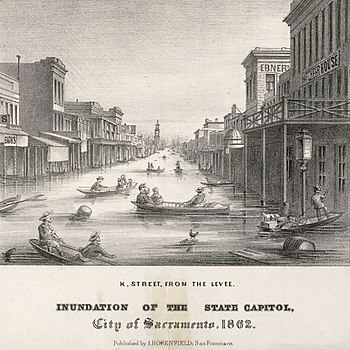 As a result of flooding, the California State Legislature was temporarily moved to San Francisco during rebuilding and renovating the sunken city of Sacramento. The city of Sacramento suffered the worst damage due to its levee, which lay in a wide and flat valley at the junction of the American and Sacramento rivers. When the floodwaters entered from the higher ground on the east, the levee acted as a dam to keep the water in the city rather than let it flow out. Soon the water level was 10 feet (3.0 m) higher inside than the level of the Sacramento River on the outside. ... I was a passenger on the old steamer Gem, from Sacramento to Red Bluff. The only way the pilot could tell where the channel of the river was, was by the cottonwood trees on each side of the river. The boat had to stop several times and take men out of the tops of trees and off the roofs of houses. In our trip up the river we met property of every description floating down—dead horses and cattle, sheep, hogs, houses, haystacks, household furniture, and everything imaginable was on its way for the ocean. Arriving at Red Bluff, there was water everywhere as far as the eye could reach, and what few bridges there had been in the country were all swept away. A chain gang was sent to break open the levee, which, when it finally broke, allowed the waters to rush out of the city center and lowered the level of the flooding by 5–6 feet (1.5–1.8 m). Eventually the waters fell to a level on a par with the lowest part of the city. From January 23, 1862, the state capital was moved from flooded Sacramento to San Francisco. Sacramento put efforts into restructuring the city’s foundation by re-channeling the American River, reinforcing the established levee system, and passing a two-decade project to raise the city above flood level. Due to the high costs associated with flood recovery the city of Sacramento reached out to the aid of the Transcontinental Railroad Co. which was a major turning point in levee resilience and reconstruction. Prior to the great flood, levee breaks and failures caused much destruction from flooding. The Transcontientnal Railroad had laid tracks across the Sierra Nevada and stationed it’s major repair and production line in Sacramento. At the time, Chinese labor force consisted of immigrants accustomed to the Mediterranean climate that closely resembled that of their homeland. The Chinese workforce of over 14,000 works reconstructed levees under the guidance of Charles Crocker, the head contractor for Central Pacific Railroad. In response to a weak levee system and seasonal flooding, flood plain architecture was incorporated in residential infrastructure evident in Victorian buildings throughout Midtown to Downtown Sacramento. Flood design includes raised front porches with stairs leading down to the street. In addition, small hallow spaces are built into the basement level to allow for basement flooding and aeration . Old Town Sacramento was raised 15 feet above flood level. Ruins of the old city remain underneath the streets as tunnels leading nowhere with hallow sidewalks, filled in entrances, trap doors, and rubble where storefronts and walkways used to be. Large wooden beams and dirt brought in from surrounding areas helped to stabilize and build on top of the once flooded city. The road from Tejon, we hear, has been almost washed away. The San Fernando mountain cannot be crossed except by the old trail ... over the top of the mountain. The plain has been cut up into gulches and arroyos, and streams are rushing down every declivity. The plains of Los Angeles County, at the time a marshy area with many small lakes and several meandering streams from the mountains, were extensively flooded, and much of the agricultural development that lay along the rivers was ruined. In most of the lower areas, small settlements were submerged. These flooded areas formed into a large lake system with many small streams. A few more powerful currents cut channels across the plain and carried the runoff to the sea. At Santa Barbara County, the narrow coastal plains were flooded by the rivers coming out of the mountains. The San Buenaventura Mission Aqueduct that was still drawing water from a tributary of the Ventura River for the town of Ventura water system, was abandoned due to the damage in the area that become the separate Ventura County in 1873. In San Bernardino County, all the fertile riverside fields and all but the church and one house of the New Mexican colony of Agua Mansa, were swept away by the Santa Ana River, which overflowed its banks. Father Borgotta ringing the church bell on the night of January 22, 1862, alerted the inhabitants to the approach of the flood, and all escaped. In San Diego, a storm at sea backed up the flood water running into the bay from the San Diego River, resulting in a new river channel cut into San Diego Harbor. The continuous heavy downpour also changed the look of the land, the previously rounded hills were extensively cut by gulleys and canyons. To the north, in the Owens Valley, similar snow and flooding conditions as those to the east in Aurora, Nevada (see below), led to the local Paiute suffering the loss of much of the game they depended on. Cattle newly driven into the valley to feed the miners, competed with the native grazers and ate the native wild plant crops the Paiute depended on to survive. Starving, the Paiute began to kill the cattle and conflict with the cattlemen began, leading to the subsequent Owens Valley Indian War. On March 1862, the Wool Growers Association reported that 100,000 sheep and 500,000 lambs were killed by the floods. Even oyster beds in San Francisco Bay near Oakland were reported to be dying from the effects of the immense amounts of freshwater entering the bay. Full of sediment, it covered the oyster beds. One-quarter of California's estimated 800,000 cattle were killed by the flood, accelerating the end of the cattle-based ranchero society. One-fourth to one-third of the state's property was destroyed, and one home in eight was carried away or ruined by the flood-waters. Mining equipment such as sluices, flumes, wheels and derricks were carried away across the state. An early estimate of property damage was $10 million. However, later it was estimated that approximately one-quarter of the taxable real estate in the state of California was destroyed in the flood. The state almost had to declare bankruptcy due to the costs of the damage and the loss of tax revenue. The Carson River Basin of the eastern California and western Utah Territory (now Nevada), suffered from a similar pattern of flooding. Flooding began in December 1861 in Carson Valley from a series of storms in the upper Carson River basin. Two feet (61 cm) of wet heavy snow fell on December 20, 1861, accumulating on the valley floor. Snow was followed by a period of very cold temperatures which froze the snow, followed by a three-day rain starting on December 25, 1861. By January 2, 1862, the town of Dayton and the area surrounding it had been flooded. In the vicinity of Aurora, there had been light snowfall in November, then mild weather until Christmas Eve, when there began a heavy and rapid snowfall for days. The temperature dropped below zero and the passes over the Sierras were closed. During the second week of January, it warmed slightly, and the snow became a torrential rain. Esmerelda and Willow gulches overflowed their banks and flooded Aurora. With water standing up to 3 inches (76 mm) deep in many buildings, adobe buildings turned to mud and collapsed. After a week, it cooled again, and snow began to fall again. Within a few days, the snow was deeper than it had been before the rains had begun to fall. Samuel Young of Aurora recorded in his diary that the snow and rain had fallen for 26 days out of 30 since December 24, 1861. The early southwestern Utah settlements in Washington County: Fort Clara, St. George, Grafton, Duncans Retreat, Adventure, and Northrop were nearly destroyed by a flood on the Virgin and Santa Clara Rivers, that followed 44 days of rainfall in January and February 1862. Survivors of Fort Clara established the modern town of Santa Clara a mile east of the old fort on the Santa Clara River. Springdale and Rockville were founded in 1862 by settlers flooded out of Adventure, Northup and other places in the vicinity. In western New Mexico Territory, heavy rains fell in late January, causing severe flooding of the Colorado River and Gila River. On January 20, 1862, the Colorado River began to rise, and on the afternoon of January 22 it rose suddenly in three hours from an already high stage nearly 6 feet (1.8 m), overflowing its banks and turned Fort Yuma in California into an island in the midst of the Colorado River. At 1 o’clock on the morning of January 23, the river reached its crest. Jaeger City a mile down river from Fort Yuma, and Colorado City, across the Colorado River from it were washed away. The river overflowed its banks to the extent that there was water 20 feet (6.1 m) deep on a ranch in the low-lying ground just above Arizona City where the Gila River joined the Colorado. The riverside home of steamboat entrepreneur George Alonzo Johnson and the nearby Hooper residence were the only places in the town unharmed because they were built on high ground. Colorado City had to be rebuilt on higher ground after the 1862 flood. The Gila River also flooded, covering its whole valley at its mouth where it met the Colorado from the sand hills on the south to the foothills on the north. Twenty miles (32 km) to the east of Fort Yuma, it swept away most of the mining boomtown of Gila City along with a supply of hay being gathered there to supply the planned advance of the California Column into Confederate Arizona. Further east the road was flooded, buildings and vehicles swept away and traffic was disrupted for some time thereafter by the mud covering the road to Tucson. The great flood in the Gila and Colorado rivers, covered their bottom lands with mud. Much of the livestock along the rivers drowned and the crops of the Indians along the river were destroyed. The overflow of the 1862 Colorado River spring flood waters reached the Salton Sink via the Alamo and New Rivers, filling it and creating a lake some 60 miles (97 km) long and 30 miles (48 km) wide. The Rio Grande has been unusually high this summer, almost the entire bottom between Fort Craig and Mesilla being still overflowed. It is impossible at this time to approach Mesilla on the west side of the river, a new channel having been washed out on that side of the town, through which the largest portion of the water flows; besides, the bottom for a long distance is overflowed, and, the soil being of a loose nature, animals mire down in attempting to get through it. Instead of crossing at Messilla, the high waters and course change forced Eyers detachment to cross the Rio Grande, up river at the old San Diego Crossing below Fort Thorn, after waiting another week for the water to go down, which allowed the rearguard of the Confederate Army to escape into Texas. Messilla, built on the west bank of the Rio Grande after the Mexican–American War, was left by the movement of the river on its east bank where it remains today. Until the Great Flood of 1862, what became Port Isabel Slough, in Sonora, Mexico, was a shallow tidewater slough, but the extreme flood waters of that year cut its channel much deeper, so that at low tide it still was three fathoms deep. The mouth of this slough was only 5 miles (8.0 km) from the mouth of the river and sheltered from the extremes of the tidal bore of the Colorado River and deep enough to prevent stranding on shoals or mud flats at low tide. This made it an ideal anchorage for maritime craft to load and unload their cargo and passengers from the steamboats that took them up and down river without the danger from the tides that they were having to risk in the estuary at Robinson's Landing. In the month of March 1865, the schooner Isabel, from San Francisco, commanded by W. H. Pierson, found and entered this slough and discharged her cargo there for the first time. Subsequently, the steamers, sailing ships and later ocean-going steamships loaded and off-loaded their cargoes there, and the steamboat company established Port Isabel 2.5 miles (4.0 km) above the mouth of the slough. The port lasted until 1878. After the Southern Pacific Railroad reached Yuma, it was abandoned the following year, the shipyard there being removed to Yuma. The storm was not an isolated occurrence. Geologic evidence has been found that massive floods, caused by torrential rainfall from massive storms, have occurred in California roughly every 100 to 200 years. 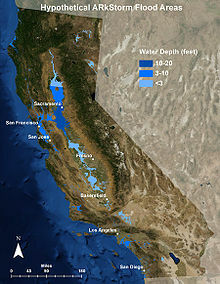 The flood has been studied by the United States Geological Survey and emergency planners, who use it as an example when modelling the impact of a similar event happening in modern-day California. The official name for such an event is an "ARkStorm", and it is unofficially called "The other big one". ^ Dettinger, M. D.; Ingram, B. L. (January 2013). "The Coming Megafloods" (PDF). American Scientific. 169: 64–71. ^ Null, J.; Hulbert, J. (2007). "California Washed Away: The Great Flood of 1862". Weatherwise. 60 (1): 26–30. doi:10.3200/wewi.60.1.26-30. ^ a b Becker, Rachel (May 26, 2018). "The hardest part of preparing for disasters is overcoming human nature". The Verge. Retrieved May 29, 2018. ^ "Dave Reynolds Recognized at 2012 California Extreme Precipitation Symposium". Earth System Research Laboratory, NOAA. August 10, 2012. Retrieved 1 March 2016. ^ Ingram, B. Lynn (19 January 2013). "California Megaflood: Lessons from a Forgotten Catastrophe". Scientific American. Retrieved 10 April 2013. ^ "Atmospheric River Information Page". Earth System Research Laboratory, NOAA. Retrieved 1 March 2016. ^ a b c d e f g h i Lansing Wells, Edward (1947). "Notes on the Winter of 1861–2 in the Pacific Northwest" (PDF). Northwest Science. 21. Archived from the original (PDF) on June 10, 2011. ^ Null, Jan; Hulbert, Joelle (January–February 2007). "California Washed Away: The great flood of 1862" (PDF). Weatherwise. p. 29. Retrieved 3 October 2010. ^ Thomas, Mike. "Linn City, Oregon: A Victim of Nature's Wrath". Bureau of Land Management. Archived from the original on September 30, 2016. Retrieved June 1, 2011. ^ "Route of the Oregon Trail In The Upper Boise Valley, Idaho State Historical Society Reference Series" (PDF). 450 N. 4th Street, Boise, ID 83702. 1973. Archived from the original (PDF) on 4 February 2011. Retrieved 31 July 2011. ^ a b c d e f g h i j Newbold, John D. "The Great California Flood of 1861–1862" (PDF). San Joaquin Historian. San Joaquin County Historical Society. 5 (4). Retrieved 1 March 2016. ^ "The American River gave birth to Sacramento with the discovery of gold in 1848. Ever since then the river has been trying to take the city back". American River Watershed Project. Retrieved 1 March 2016. ^ Secrest, Jr., W.B. ; Secrest, Sr., W.B. (2006). California Disasters, 1800–1900. Quill Driver Books/Word Dancer Press, Inc. ISBN 1-884995-49-7. ^ Carr, John (1891). Pioneer days in California. Times publishing company. pp. 291–295, 397. Retrieved 7 October 2010. ^ a b William H. Brewer, Up and Down California in 1860–1864: The Journal of William H. Brewer, Yale University Press, New Haven, 1930. ^ a b "Historic Rainstorms in California". California Department of Water Resources. Archived from the original on 2007-08-24. Retrieved 2007-10-23. ^ a b c Ingram, B. Lynn (January 1, 2013). "California Megaflood: Lessons from a Forgotten Catastrophe". Scientific American. Retrieved 19 February 2016. ^ Mildred Brooke Hoover, H. E. Rench, E. G. Rench, Historic Spots in California, Third Edition, Stanford University Press, Stanford, 1966. pp. 540–541 Knight's Ferry. ^ a b c "The Great Flood in California: Great Destruction of Property Damage $10,000,000". The New York Times. 21 January 1862. ^ Muir, J. (1894). The Mountains of California: Chapter 11 The River Floods. The Century Co., New York. ^ Null, J., Hulbert, J. (2007). California Washed Away: The Great Flood of 1862. Weatherwise, 27-30. ^ "USGS California Water Science Center". ca.water.usgs.gov. 2018. Retrieved 2019-04-07. ^ "Center for Sacramento History". www.centerforsacramentohistory.org. 2015. ^ A&E Television Networks. "Transcontinental Railroad". HISTORY. Retrieved 2019-04-07. ^ Castaneda, C., and Simpson, L. (2013). River City and Valley Life: An Environmental History of the Sacramento Region, University of Pittsburgh Press. ^ "Sacramento History Museum". sachistorymuseum.org. Retrieved 2019-04-07. ^ Cleland, Robert Glass (1941). The Cattle on a Thousand Hills: Southern California, 1850–1880. Huntington Library; University of California Press. p. 128. ISBN 978-0-87328-097-6. ^ Lin II, Rong-Gong. "The 'nightmare' California flood more dangerous than a huge earthquake". Los Angeles Times. Retrieved 20 February 2019. ^ a b McGlashan, H. D.; Ebert, F. C. (1918). "Southern California Floods of January 1916". U. S. Geologic Water Supply. ^ "California Historical Landmark: Ventura County". Office of Historic Preservation. California State Parks. Retrieved 2012-10-15. ^ Taylor, M.D., W. Leonard; Taylor, PhD, Robert W. (2007). "The Great California Flood of 1862". The Fortnightly Club of Redlands, California. Retrieved 3 October 2010. ^ William H. Brewer, Up and down California in 1860–1864, New Haven, Yale University Press, 1930, p. 243 Retrieved 23 October 2010. ^ U.S. Department of Agriculture, 1973, Water and related Land Resources, Central Lahontan Basin, Carson River Subbasin, Nevada and California, Special Report: History of Flooding, Carson Valley and Carson City Watershed, U.S. Soil Conservation Service, Minden, NV. ^ Roger D. McGrath (1987). Gunfighters, Highwaymen, and Vigilantes: Violence on the Frontier. University of California Press. p. 21. ISBN 978-0-520-06026-5. ^ "Janet Burton Seegmiller, A History of Iron County, Community Above Self". Utah State Historical Society, Iron County Commission. 1998. ^ "Commanding Officer's Quarters & Kitchen Historical Marker". ^ War of the Rebellion: A Compilation of the Official Records of the Union and Confederate Armies. Published Under The Direction Of The Hon. Daniel S. Lamont, Secretary of War, BY Maj. George W. Davis, U. S. Army, Mr. Leslie J. Perry, Civilian Expert, Mr. Joseph W Kirkley, Civilian Expert, Board of Publishers. Series I, Volume L, In Two Parts. Part I, Reports, Correspondence, Etc., Government Printing Office, Washington. 1897, p.125 Letter from Lieutenant- Colonel, E. E. Eyre, First California Volunteer Cavalry at Fort Thorn to Headquarters, Column from California, July 8, 1862. ^ "What's in a Name?". The Arizona Sentinel. January 14, 1882. p. 2. ^ The west coasts of Mexico and Central America from the United States to Panama including the gulfs of California and Panama. United States Hydrographic Office, Government Printing Office. 1904. pp. 155–157. ^ "Overview of the ARkStorm Scenario" (PDF). USGS. p. 2. ^ "ARkStorm: California's other "Big One"". USGS. "The 1861–1862 Floods: Informing Decisions 150 Years Later". California Extreme Precipitation Symposium. June 26, 2012. Retrieved March 1, 2016. Hunsaker, Leon; Curran, Claude (November 2005). "Lake Sacramento — Can It Happen Again?" (PDF). Retrieved March 1, 2016. Ingram, B. Lynn (2013-01-01). "California Megaflood: Lessons from a Forgotten Catastrophe". Scientific American. Retrieved 2017-01-09.